Students come on their own horse for private lessons. They are encouraged to stay and watch other students for maximum benefit. Riders in clinics work on their seat. They develop the refined skills necessary to direct the horse in all elements of co-ordination necessary to dressage. Rhythm, bend, iumpulsion, collection etc. The emphasis is on communicating through correct technique. The aim in clinics is to produce high quality, accurate, energetic dressage in the most harmonious way possible. Rider and horse move as one body, one beautiful picture. Clinics are for any keen rider over 15yrs of age. Often they are organised by instructors to bring a fresh perspective on the subject to their students. Richard is often consulted by students and instructors when difficulties arise in coordination of horse and/or rider. 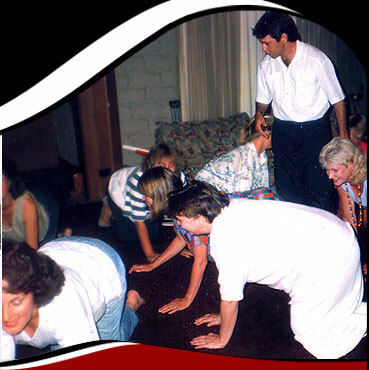 Clinics are conducted in many locations in Australia, New Zealand, and Europe. See Localities for a list of locations. A well lit indoor arena with a good low dust working surface. This is the top of the range experience for participants. It is a Dressage Clinic with the addition of Alexander Technique lessons. These hands on sessions heighten awareness and improve co-ordination skills. Sally Weis or another qualified, movement oriented Alexander Technique Teacher gives these lessons which help fast track learning of riding skills and deepen a riders understanding of training principles. Alexander Technique is sometimes called Dressage for the rider and Dressage is called Alexander Technique for the horse. Both disciplines are based on the same principles of co-ordination. The aim of the Dressage and Alexander Technique Clinic is to improve the co-ordination of both horse and rider. Riders learn to do with their own body what they would like the horse to do. Dressage and Alexander Technique Clinics are ideal for riders looking to deepen their understanding of how to achieve a poised, effective elegance to compliment the dressage picture. They are also very useful for riders with physical difficulties, recovering from injury, or getting back to the saddle after a long break. Where possible 40 min. Alexander Technique lessons are given before a riding lesson. Both compliment and inform the other. The Riding lesson is a chance to put new levels of coordination into action. - A well lit indoor arena with a low dust working surface. - A flat bottomed high backed chair (like a dining table chair). - A firm, tallish massage table. - A comfortable medium sized room or space under cover at the end of the arena if the weather is mild. Dressage/Alexander Technique Awareness Classes are conducted in small groups of interested students. Group participants have brief hands-on guidance sessions between and during awareness games (well designed activities that help develop riding skills). Working in a small group is not a substitute for one to one Alexander Technique or Dressage lessons. It can however be a valuable adjunct, because the group of indiviual students stimulate each others learning process. Small groups are conducted in the School at ï¿½Hidden Farm'. Sally will also travel to conduct them either independently or in association with Richard's clinics. Copyright © Richard Weis 2005. All Rights Reserved. Site by ruemedia.